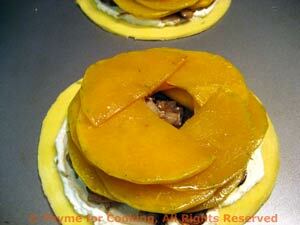 Butternut Squash and Mushroom Tarts, Thyme for Cooking gourmet starter. I used the 'neck' end of a 2lb (1kilo) squash for these. It gave me nice, thin half circles that followed the shape of the pastry perfectly. The toasted walnuts add crunch and make an elegant finish. Lay pastry out flat and cut 2 large circles, 5 - 6" in diameter (13 - 15 cm). Use a soup bowl as a guide. Lay the circles on a baking sheet. With a dull knife, lightly score a line about 1/3" (1cm) inside the edge of the pastry. It helps the edges to raise. Clean and thinly slice leek. Use about 4 inches (10cm) of leek. Peel squash using vegetable peeler or sharp knife. Cut off the neck end as close to the round end as possible. Cut the neck end in half the long way (through stem). Lay one half flat and cut 24 paper thin slices (half circles). I used just less than 3" (7.5cm) for all 24 slices. Wrap and refrigerate the rest. Add walnuts and sauté 5 minutes, until toasted. Remove walnuts to a plate, leaving oil and butter behind. Add mushroom and leeks to same pan and sauté 5 minutes. Remove mushroom/leek to a plate. Add butternut squash slices in a single layer and sauté 1 minute per side. I did it in two batches. When done remove and stack up on a plate. Divide rosemary and sprinkle over ricotta. 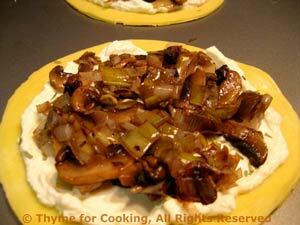 Divide mushroom/leek and spread over ricotta. Divide squash slices and lay on mushroom/leek in the following pattern: 1 slice each: top, bottom, left, right with corners overlapping as needed but with small square opening in center. Do a 'mental' 1/4 turn of the pastry and repeat layers; twice. Bake in a pre-heated oven at 400F (200C) for 12 - 15 minutes, until sides of pastry have puffed around middle and are golden brown and squash is starting to brown. Remove. Divide walnuts and spoon into center of squash. Serve.